NATO Secretary-General Jens Stoltenberg speaks during a media conference at NATO headquarters in Brussels on April 26, 2018. The summit comes weeks after Western countries accused Moscow of poisoning a former spy in Britain. Tensions were further increased following Russia ally Syria’s alleged chemical weapons attack, and the retaliatory airstrikes by the United States, France and Britain. While that military action was not organized through NATO, the bloc offered its approval at the time. People walk outside the entrance of the new NATO headquarters in Brussels on April 19, 2018. NATO ministers will hold their last meeting in the old headquarters on April 27, 2018 before moving permanently to a new building across the street. “This includes the illegal and illegitimate annexation of Crimea, the destabilization of eastern Ukraine, meddling in democratic processes, cyberattacks and disinformation,” Stoltenberg told reporters. Foreign ministers will also discuss security in the Middle East and north Africa, especially Iraq. “We are currently planning for a training mission of several hundred [people]. They will train Iraqi instructors and help build Iraqi military schools,” added Stoltenberg. New U.S. Secretary of State Mike Pompeo is headed to Brussels for the NATO talks ahead of a trip to the Middle East. Pompeo, who was sworn in on Thursday, succeeds Rex Tillerson, whom President Donald Trump fired last month. Trump is expected at the leaders’ summit in July. Analysts say NATO allies will be hoping for further reassurances of U.S. commitment. Enlargement also is on the summit agenda, with Ukraine restating its ambitions to join the organization. At a Kyiv security conference last week, NATO’s deputy secretary-general, Rose Gottemoeller, offered measured encouragement to her hosts. "I think those are very important and realistic goals but I’m not going to hide from you that you have a lot of heavy lifting to do before you are ready for NATO membership. Important reforms have to be carried out. 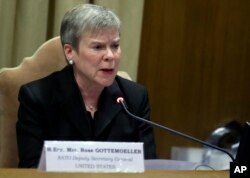 They are the reforms of defense institutions, the security institutions,” said Gottemoeller. The conflict with Russia has driven a big change in Ukrainians’ attitudes toward NATO, according to Orysia Lutsevych of Chatham House, a London-based policy institute. “If you compare the public support before the war with Russia and now, it almost doubled. So, there’s also a public support for that policy. Now again, as with many things in Ukraine, the devil is in the implementation. And if Ukraine manages to pool all the necessary human, financial resources and proper coordination, then I think it has a success story to tell to its NATO partners,” said Lutsevych. Ukraine’s admission would open up a new NATO border with Russia in a highly volatile region, and the process is expected to take years or decades. NATO’s secretary-general emphasized Thursday that dialogue with Moscow was crucial, adding that the organization was working toward a meeting of the NATO-Russia Council. That forum was suspended in 2014 following Russia’s forceful annexation of Crimea.